Dante: *I run feeling the earth beneath my paws, run and feel one with my woods, my beast on edge, the alpha should make it to the circle before the full moon rises and as i run i can feel the moon light, guiding me, giving me light. 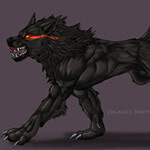 Accalia- large tan wolf, dark mysterious black eyes, Beta of Donte... wolf form: 9' 5"
Accalia-" where is he? damn you Donte, why aren't you here yet" I think outward to my trusted alpha. " we're al here and waiting for you," my sides heave as I feel him running hard. With the moon so close to her peak in the sky I plead for my alpha to arrive, " Hurry the twins are getting restless." With the last moments closing in on us I quited the rest of the pack. Accalia- My sides heave as I get the pack settled, " shall I start? I mean the howling part anyway." I could feel my Alpha's reassurance that he'd be there in time,. "Just the first howl, to keep them in check" with a sigh his husky thoughts were hushed. I lifted my massive head and let one long deep sorrowful howl release itself into the world of many sounds. Mine and Dante's were distinct, his deep sounding and commanding, mine sorrowful and serious. My howl was joined by the rest of the pack as they all started to circle where the great Alpha would sit momentarily. Our howls ended and our large powerful leader Dante gracefuly entered the circle and began the gathering below the blue moon's peak. Accalia- The last of our songful howls sounded off in the night. "Dante, are we hunting tonight? 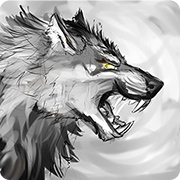 I've been speaking with the pack, your not your usual self. And we were hoping you'd take us on that hunt you've been promising." Dante's giant figure shivered with an understood feeling, a feeling of lust for something, for the feel of adreniline surging within him, "I plead for the same my trusted Alpha, as does the rest of the pack" I look around at them, all my brothers and the missing sister I now wonder about. My thoughts shift violently as I toss a thought at Dante," My sister, your mate and the pup?" My thoughts full of worry for my true sister. She an I by the same mother had helped Dante start his pack and now I was scared for here, she never missed a meeting. Had she givin birth and was now all alone?